Taiwan is a small island at the south of China. Now it is a very special place to me. 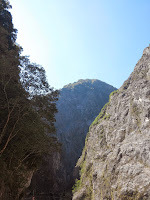 I went to Taiwan with my mom and dad at the last week of October. It was a fascinating trip, and I took a lot of pictures! It wasn't my first time to ride a plane, but I was very excited and afraid when the airplane swung to one side or shook a little. The clouds under me were like soft cotton. This is the picture I took when I stared out the window in awe. 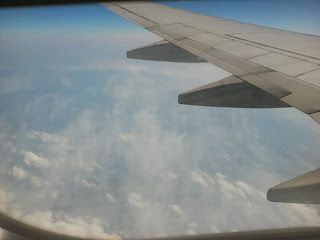 Fortunately, the plane safely landed on Taiwan, and I was very relieved. 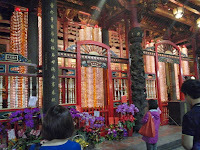 The first place we visited was the Longshan Temple. 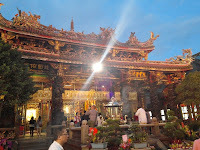 The temple was covered with golden dragons and golden clouds. 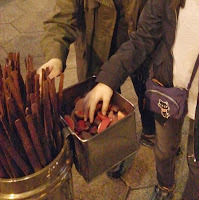 There were a lot of people praying with incense sticks between their palms. I prayed too, although I felt a bit awkward between all those solemn people. There was also a box full of strange wooden things that looked like apple slices. It is known to bring good luck if you throw two slices on the ground, and one lands at its round side and the other lands on its flat side. There were countless old ceramics in the National Palace Museum. The most famous thing in this museum was a cabbage made out of white and green jade. It is a treasure a Qing dynasty's queen brought when she married. There is a locust and a katydid on the cabbage, and they resemble children. A lot of people gathered to see the jade cabbage, and I had to wait in a long line. The cabbage was very shiny and delicately carved, but not that appetizing. After all that walking in the museum, my feet ached so much that it seemed like it would burst into pieces! Tailuge Gorge was far away from the hotel I stayed, so I had to ride a train for a few hours. The valley was deep, and there were great mounds of rock all around me. 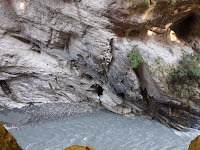 There were a lot of holes on the enormous rocks that were called 'Swallow holes'. 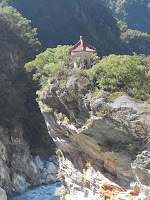 The water flowed below, and it was gray because it washed some marble from the rocks. It was as if I was in a very big studio with rocky walls and dazzling stage lights. There was also a bridge that crossed over the water. It was somehow like the bridge I saw in the Shrek movie which was crossing over boiling lava. I ran over and over on that bridge, and I had a lot of fun making fun of the water flowing below. I had a very unique experience here - flying the Tian Deng. The Tian Deng is a kind of small hot-air balloon made with colorful papers. There are four sides of the Tian Deng and you can write your wishes there with a writing brush. This is a part of the side I wrote. These are what I want this year. Fire was put at the bottom, and the Tian Deng flew away, narrowly avoiding crashing into a roof. It flew away with all my wishes. There was a bug at the place where I wrote 'Go away bug! ', and I wonder if the bug went up to the sky riding on it? I wanted to follow it with my eyes until it popped or something, but it just vanished out of sight while I turned my head. 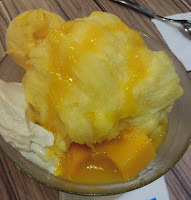 There were lots of delicious stuff to eat in Taiwan, but the best one was of course, the mango shaved ice! These are the ones I ate. 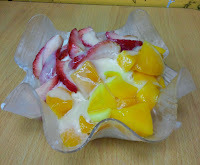 I love mangoes, and there were tons of mango slices in these shaved ices. Those sweet gold cubes just melted in my mouth. However, I never knew that I was going to have an extraordinary experience just because of this desert. It was my last night in Taiwan, and I was waiting outside the shaved ice store. Then I noticed that the platform I was standing on was swinging from side to side. I instinctively thought that the platform might be hanging from the ceiling, but when I looked inside the store, I found that the water in a big tank was also slopping wildly! Oh my! It was an earthquake - and the first one in my life. Fortunately, it was not a big one, and it stopped after a minute. At first I was scared to go inside the shaved ice store, but I did, and within 10 minutes, I just fell in love with the mango slices and didn't care anymore. I would always remember these days in Taiwan. There were times when I was too shy to talk to the Taiwanese people, but there were also times when I successfully did. I can speak Mandarin, but I don't really know the Taiwanese accent. One time we were almost lost in the subway station of Taipei. We had also met some Koreans by coincidence while visiting the Longshan Temple. I miss all these things already. 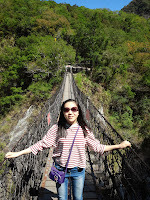 Before the trip, Taiwan was just a small island to me, but now it is a special island full of unforgettable memories.